Another make-believe moment here… I am miles away from the big apple, but can’t help but daydream about taking a stroll through Central Park with the balmy, spring weather we’ve been having as of late! 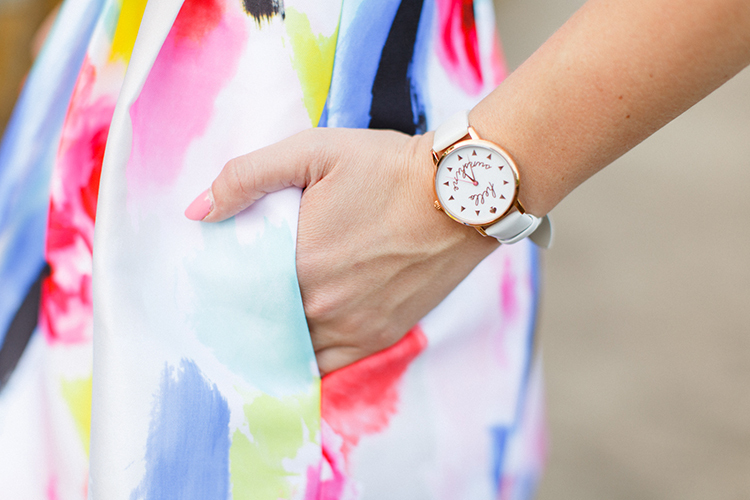 And in an ensemble equally as enchanting and full of color, of course. In these darling Kate Spade pieces, I can almost hear the traffic and feel the energy of New York City on a bustling, May morning. 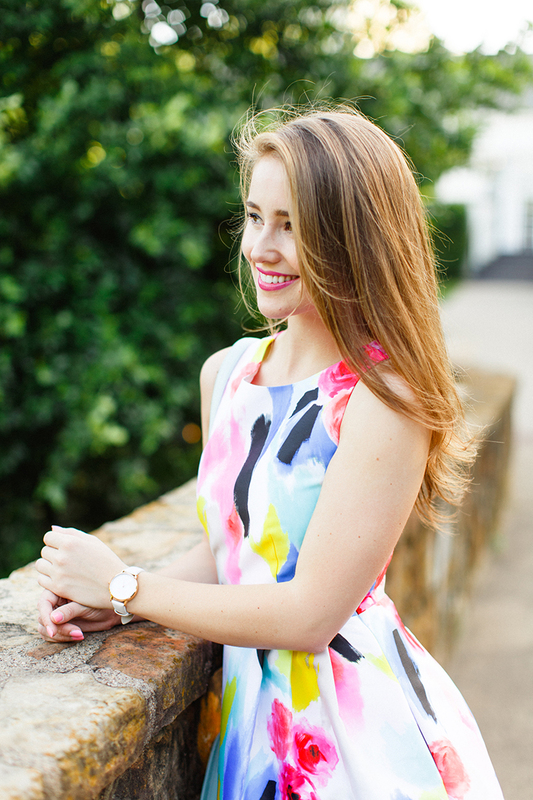 Have you ever come across a print as beautifully vibrant and enrapturing as the one in this darling dress? The colors alone put a smile on my face, not to mention the classic, feminine cut and precious bow-back detailing! I already have a few weddings and luncheons I can’t wait to wear it too. And if you’re looking for a graduation dress, I couldn’t dream up a more picture-perfect frock than this! One thing I love about Kate Spade is the line’s attention to detail. The unique pops brought in by this darling mint cross body bag (my favorite spring handbag as of late) and striped wedges round out this cheery look in the most feminine, fun way possible. Two attributes I always look for in style! A favorite touch? The “hello sunshine” scribbled onto the face of the beautiful white watch. Safe to say each part of this outfit has enough happy to stand along… but put them together? You’ve got magic. Wishing everyone a lovely weekend! I’m taking off again… this time to Houston and College Station, Texas! Planes, trains and automobiles, y’all. That’s been the theme of my spring thus far, and I’m not complaining. Anyone have any fun plans? This dress is stunning! I love it! So beautiful! This dress is absolutely beautiful! I need it ASAP! I hope you have a wonderful weekend and safe travels! Such fun photos and that dress looks amazing on you!! Enjoy your weekend! 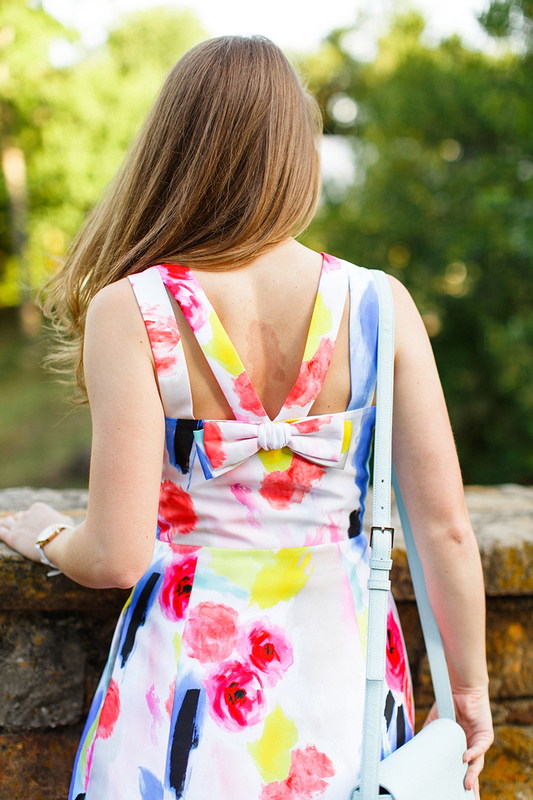 Love the colors of the dress, and the back is absolutely adorable! This dress looks adorable on you, Kate! It’s perfect for spring! I need this whole outfit! It is so cute! Oh my goodness I’m in love with this dress! and the fact that it has pockets…it’s perfect!! YES girl! 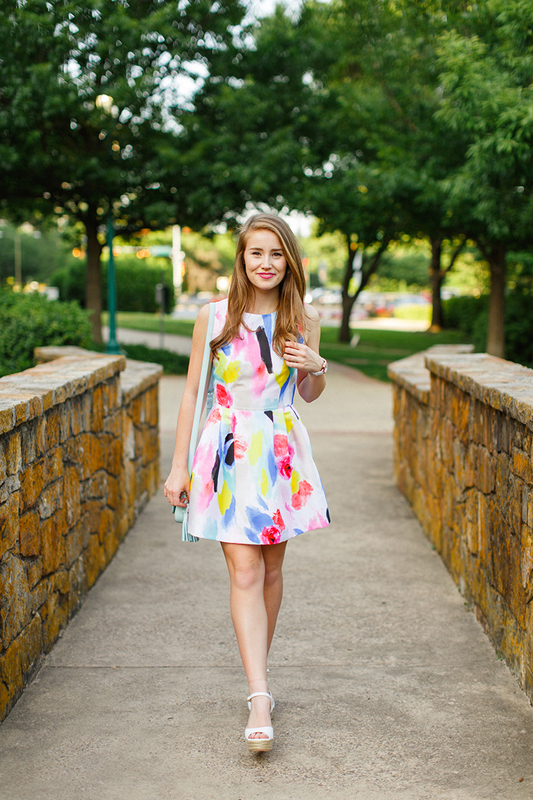 (insert dancing emoji here) This dress is so perfect for the spring! How festive. I LOVE this dress! Modest but still fun and girly! And it has pockets? Definitely a winner! 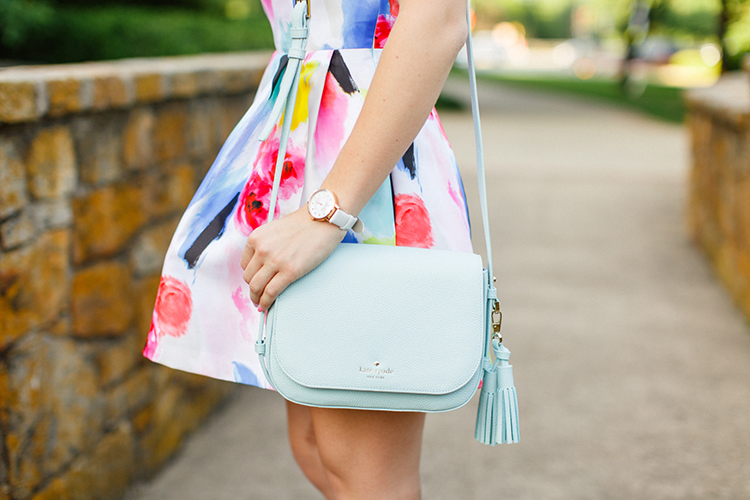 Kate Spade is the BEST! I just love all the colors! Kate, you look like a beautiful painting come to life. We at VacayStyle love your fashion sense. 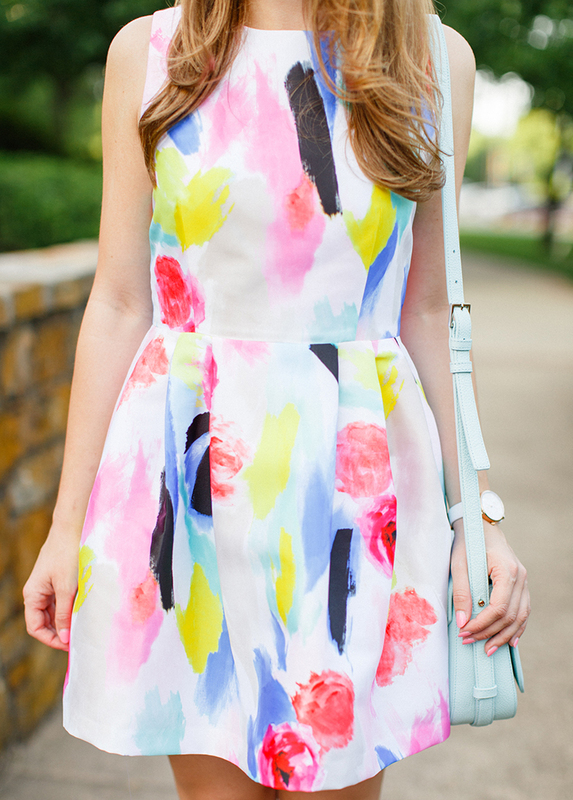 This dress looks so super cute on you! I actually bought it, but found the side zipper stuck at the waist seam. I’m wondering how you found the fit. Maybe I had bad luck and just got one with an inferior zipper? Or maybe you have a few tips and tricks for sticky zippers?